Stephen Frears' new drama "Philomena", which opened today, is a joyous, heartfelt treasure. The film is based on the true story of Ireland's Philomena Lee, a mother whose "out-of-wedlock" son was taken from her at an Irish convent in the 1950s and forced into adoption by the Catholic Church in America. Judi Dench is marvelously winning in a fine portrayal of the title character. She, and Steve Coogan, who plays British journalist Martin Sixsmith, are excellent together in this poignant road and air journey to locate Philomena's son, whom she longs to see again. The cynical Martin goes against his nature and decides to write a human interest story about Philomena's predicament. On their journey the anecdotal Philomena gets immersed in American pop-culture and eating habits. 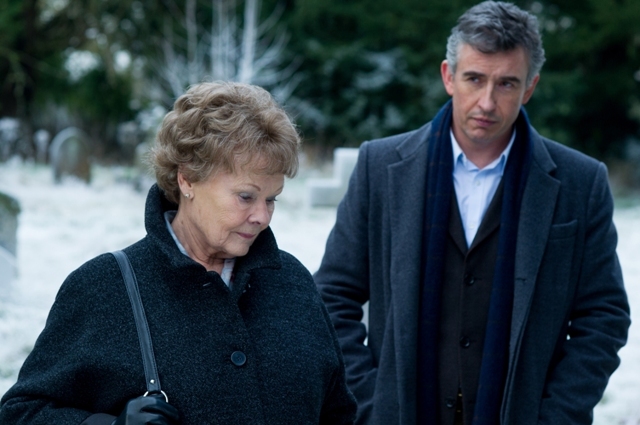 Martin's tolerance wears a little thin as roads to finding Philomena's son Anthony run cold. Ms. Dench finds grace, compassion, forgiveness and sorrow in Philomena in a sweet, affecting turn that warms the heart. Mr. Coogan, also great here, utilizes gruff impatience to mask some of the delicacy and sensitivity he has for his traveling companion, who form an odd couple. Martin, deeply skeptical of God's presence, is a would-be son to the devout Philomena, and in several scenes you sense her reaching out to embrace him in that manner. "Philomena" is an intimate, deftly-balanced film with three emotional temperatures. Philomena's deep anguish about her son has mellowed to a restraint and quiet persistence over the years. In Martin, a caustic, rash and sometimes raging figure of self-righteousness, avoidance of some things is his sanctuary. In Mr. Frears the director, there's pure elegance and elegy. His beautiful, touching tribute to Philomena's son, in a wonderful array of memories and footage, forms the affectionate overlay for his film. The director is the mediating presence of Philomena's and Martin's feelings and personalities, and his shots of Anthony show us the common object of these radically different adventurers. Mr. Frears smartly avoids heaping platitudes or scenes of pity on his characters or the audience as he deliberately paces this story with succinct and often comedic dialogue written by Mr. Coogan and Jeff Pope. Their script is based on Mr. Sixsmith's book The Lost Child Of Philomena Lee. Sprinkled with some pain and sadness but absent of melodrama, the undeniably enjoyable "Philomena" is an intelligent, moving and thoughtful film about faith, cynicism and love. There's discussion of the Catholic Church, tradition and various complications that enliven the film without overwhelming it. Philomena is an example of faith in the belief that her long lost son Anthony isn't a distant memory. Along the way we learn that Philomena's son is gay. I thought of how some films frequently marginalize gays. As sincere and terrific as "Philomena" is -- Mr. Frears himself is gay, by the way -- I couldn't help thinking that a truncation of the gay voice was occurring in his film. (I had the same feeling about the recent "Dallas Buyers Club", also based on a true story.) See "Philomena" and see if you agree. Philomena's son is viewed through maternal eyes. A mother is the ultimate ally of a child, but Philomena's son doesn't truly have a voice of his own, which I suppose becomes apparent for obvious reasons. I don't believe Mr. Frears had any ill intent; it's simply something that's unavoidably noticeable in a film whose care and authenticity is maintained at all times. That said, "Philomena", a most lovely film, is an irresistible holiday treat, offering the kind of love, warmth, joy and goodwill that a great movie experience should. Also with: Mare Winningham, Simone Lahbib, Barbara Jefford, Anna Maxwell Martin, Peter Herrmann, Sophie Kennedy Clark, Michelle Fairley, Wunmi Mosaku, Sean Mahon. "Philomena" is rated PG-13 by the Motion Picture Association Of America for some strong language, thematic elements and sexual references. The film's running time is one hour and 35 minutes.